Sterling silver hammered ring with pink topaz. The ring is available in several ring sizes. You can beautifully combine the pink topaz ring with our other stackable rings. A mix and match with the blue topaz or peridot by example. The size of the pink topaz is about 4x5 mm. The pink gemstone ring is especially handcrafted for NJAmsterdam by our traditional silversmith on Bali. You will receive your ring in a jewelry gift box. 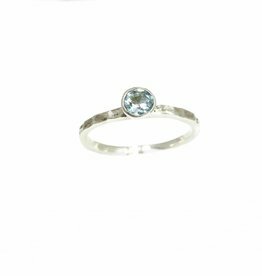 Sterling silver hammered stackable ring with sparkling faceted sky blue topaz. Available in different ring sizes. 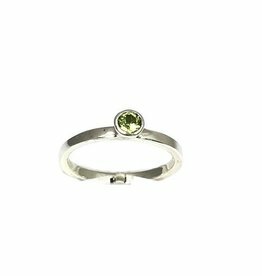 Sterling silver ring with a facetted peridot gemstone. Several ring sizes available.